Eltaj learned chess at the age of six and burst to prominence in 2002, when he won both the European and World Youth U10 Championships. He hasn't quite managed to live up to that early promise, although he's picked up some notable individual successes, including winning the Chigorin Memorial and Azerbaijan Championship in 2010 and finishing tied for first place in the 2016 Tata Steel Challengers. In team competitions he's helped Azerbaijan to numerous medals and played, for instance, in the 2014 Chess Olympiad in Tromsø. 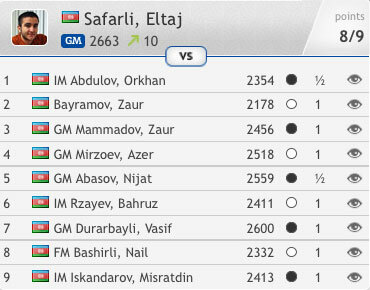 Safarli has also worked as a second for Azerbaijan's number one, Shakhriyar Mamedyarov. In 2016 Eltaj stormed through the Azerbaijan Championship, winning his second national title with an impressive undefeated tally of 8/9, a point and a half ahead of his nearest rivals.